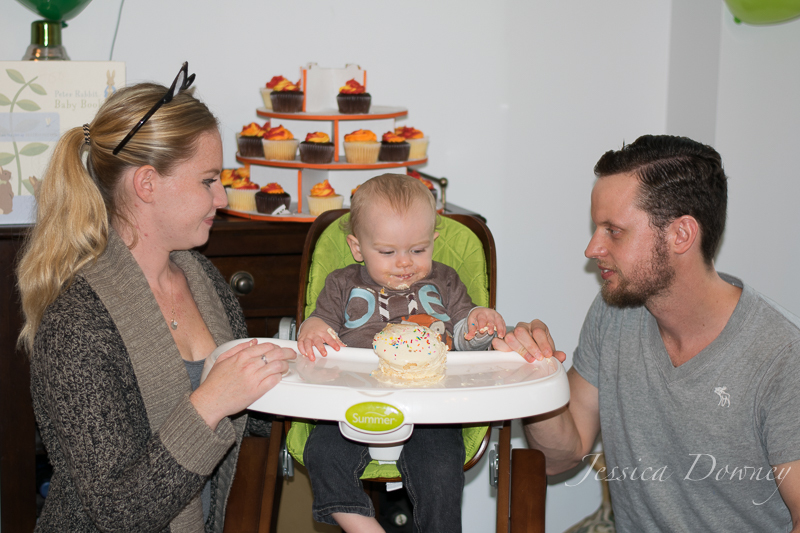 On October 24th 2015 we celebrated Nate’s first birthday at our house. I decided to have two separate birthday parties for him since we have A LOT of friends with small kids as well as family. Our house is a pretty good size but I knew it would be way too packed if we had everyone in one place so I opted to have my mom host a birthday party at her new house for her side of the family as well as Kurt’s family. 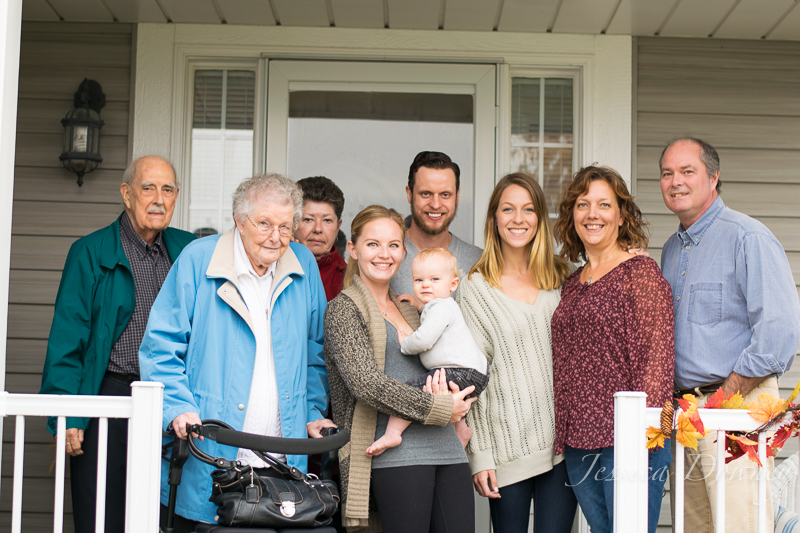 And then I hosted the party for my dad’s side as well as all our friends and their kiddos! It worked out quite nicely. At first when people started showing up I thought ‘oh we totally could have done one party’ but within like an hour or two I realized there was absolutely no way having like 40+ people in our house would have worked out. In total there was 22 adults and 9 kids for the party at our house! Anddd that’s with some people not being able to attend so can you imagine if the remaining people made it!? I for one, definitely cannot! 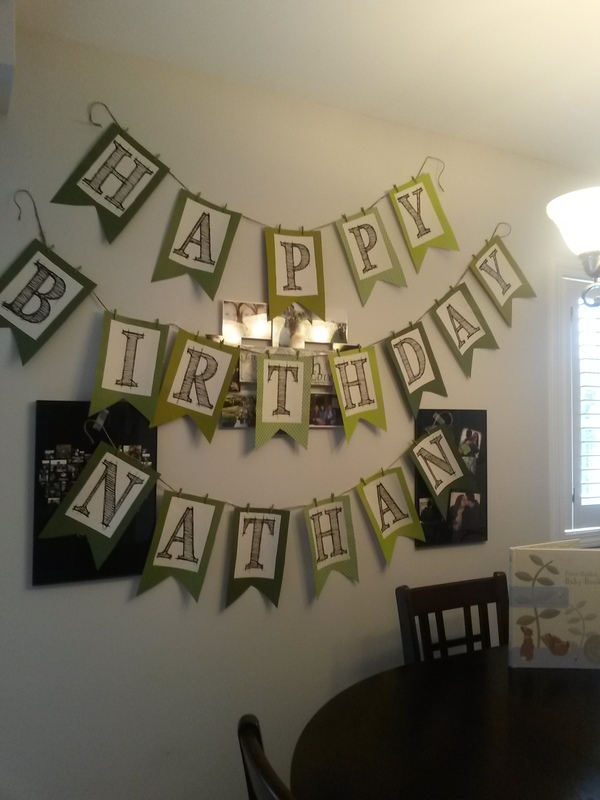 I wanted to have a themed birthday party for Nate and I thought doing something similar to how his nursery is decorated would be really fun. 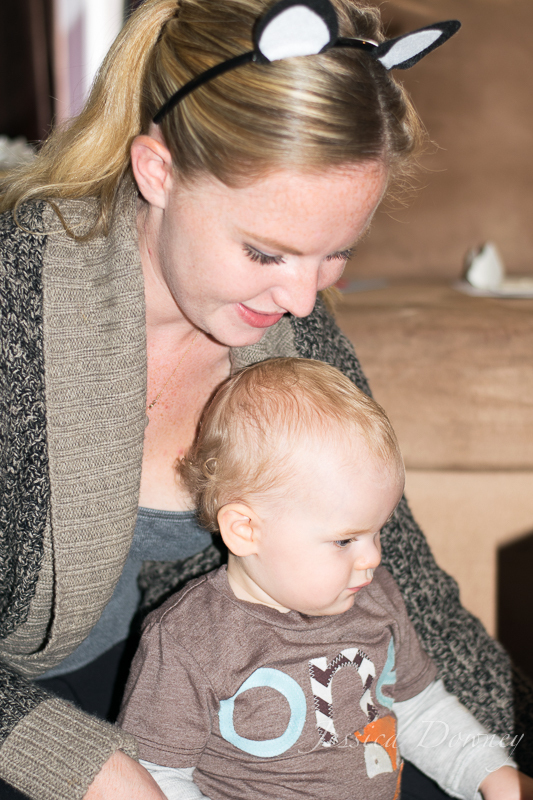 If you haven’t seen my post about Nate’s nursery you can check it out here! 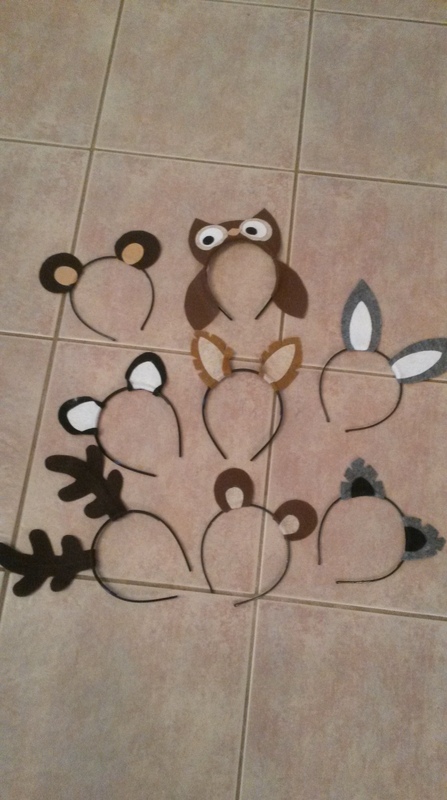 I was torn between doing a total “camp out” or “forest friends” party so I kind of mashed the two together and came up with a “forest friends camp out” party and I think it was pretty cute if I do say so myself! I had lots of decorations incorporating forest animals as well as other things you’d find in nature such as pine cones and trees. And since I had already bought Nate a play tee-pee [which I did a review on here] I thought that would work perfectly into the “camp out” aspect of the party! 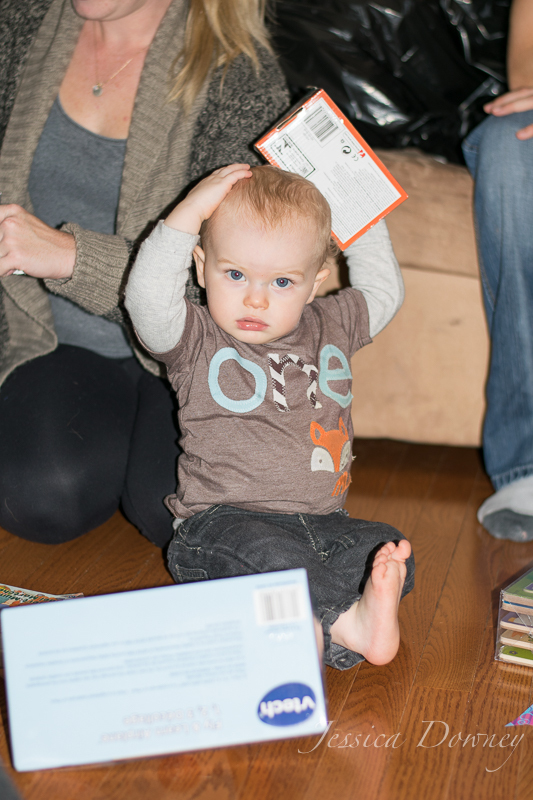 Honestly, the week leading up to Nate’s birthday party I was a total mess! Since I was already back at work, trying to find the time to actually hang the decorations and get the food ready was really stressful. 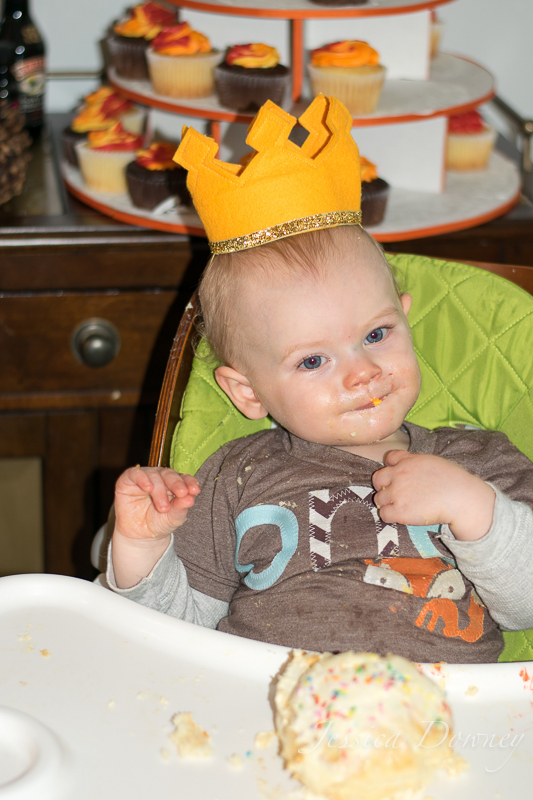 I had no idea that planning a birthday party could be so intense…or expensive! haha! 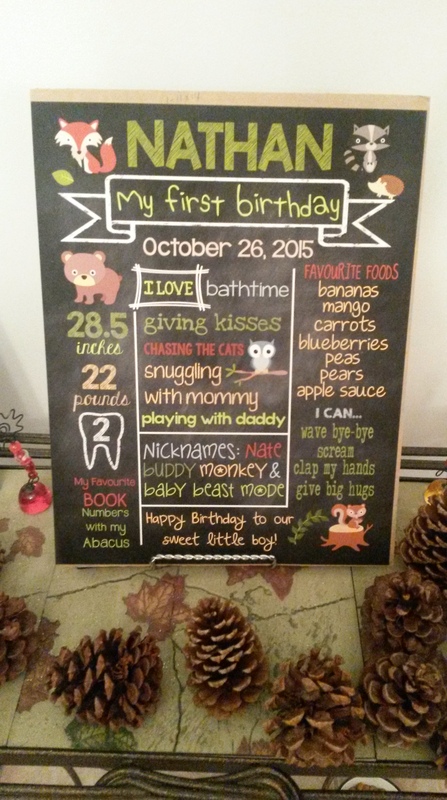 I’m so happy I actually started planning his party MONTHS in advance! Thanks to Pinterest, I had a lot of my ideas written down when Nate was around six months old. I then started purchasing things for his birthday in June/July that way it wasn’t going to be one huge bill at the end of September/start of October. I might have looked a little crazy but you know what, it was totally worth it! I would highly recommend doing this for other parents out there because honestly, it was a huge relief to know that I’d already spent money on items when I had it. I was in the transition of coming off of EI and going back to work when we had Nate’s birthday so because of this, I knew my pay checks would be two weeks behind so basically I wouldn’t be getting paid for an entire month. Luckily, having spent the money when I had it, I saved myself a lot of headaches and panic attacks later on. 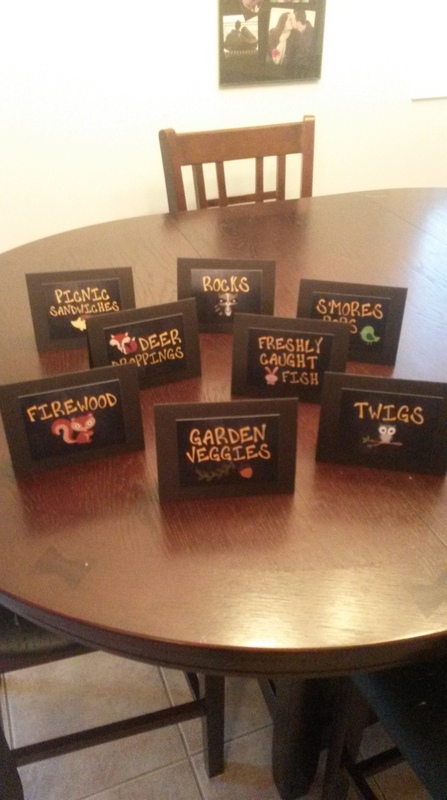 I also tried to save money where I could by making a lot of my own decorations. Thanks to the wonderful ladies over at Shanty-2-Chic, I discovered these [FREE] printable letters! All I had to do was download them then print them out on either card stock or regular paper. I then chose to glue them to scrap booking paper I purchased for 99 cents/sheet from Michael’s and then cut them out in that design. I used little green clothes pins I also bought from Michael’s to hang them onto twine! They might not have been cut 100% straight or equal in size but unless you were looking super hard, you really couldn’t tell! I also fixed the I in BIRTHDAY so it was hanging straight! I just forgot to take another picture of it after I corrected it! Oops!! I’m so in love with the “Shanty Sisters“! They give you such great plans and ideas and everything is basically free! They have several different letter designs to choose from as well as style ideas and it just makes making a banner like this so simple and easy! I also made that “I am 1” banner using their letters as well! I did the exact same thing as the previous banner, but instead I chose a different font and added in some clip art pictures. Unfortunately, I made that banner a bit too large. It was originally intended to go on Nate’s high chair but when I wrapped it around, it ended up hanging all the way around the back of the chair. I left it at first but then after a few days, I realized Kurt was right and it didn’t look good. Haha. So I then decided to just hang it behind where I was going to put his chair during the cake and hope it looked all right. Personally, I think it worked out fine but that’s just my opinion! So thanks to our close friend and Nate’s unofficial “Auntie Jen”, we had these amazing cupcakes to go along with the theme! 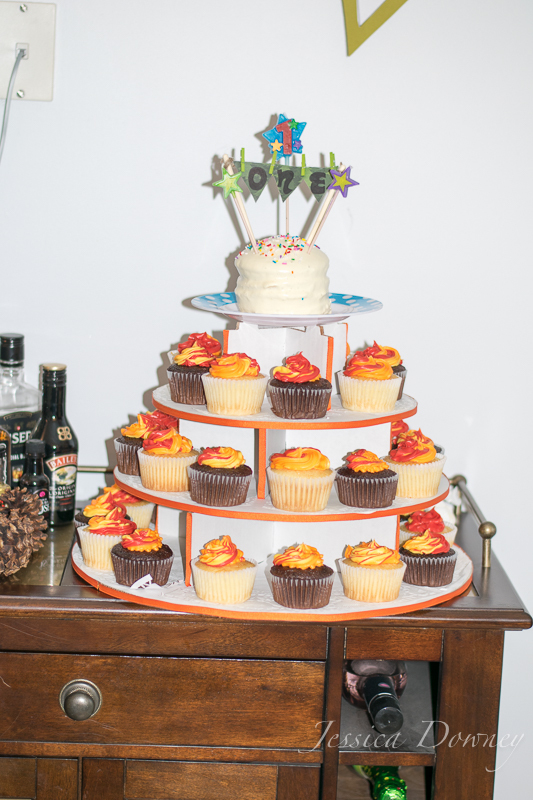 Poor Jen, is always asked to make cakes or cupcakes for all of us basically because she’s AMAZING at it; so at first I was a little hesitant to ask but when I saw these campfire flame cupcakes on Pinterest I knew I needed to do whatever I had to to get her to make them. Luckily for me, she had already seen the picture well before me and had decided then that she was making them! Yayyy! 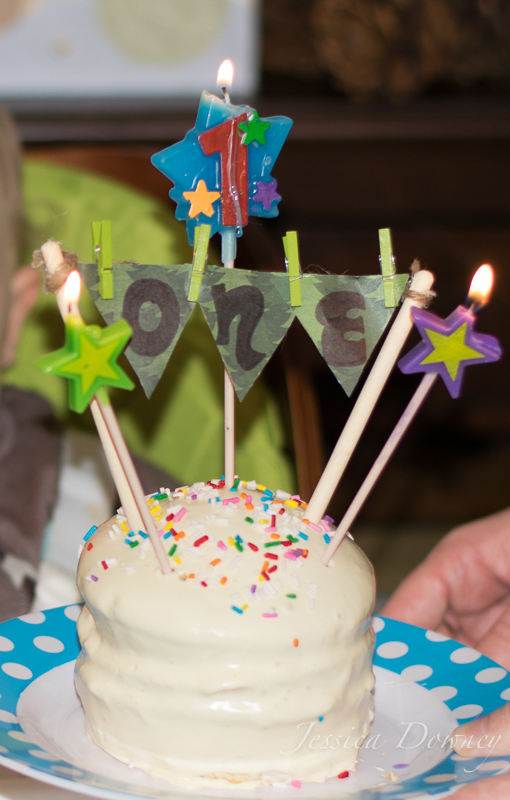 I ended up making Nate’s little smash cake. I found these tiny cake pan tins at Michael’s and thought they were the perfect size to create a little cake. I used a Cool Whip frosting receipt that I found on [you guessed it] Pinterest and then added the sprinkles and the little banner. That was probably the easiest thing I made for Nate’s party! I just used left over scrap book paper, two bamboo sticks, twine, marker, and clothes pins. Done! Looks pretty cute if I do say so myself! 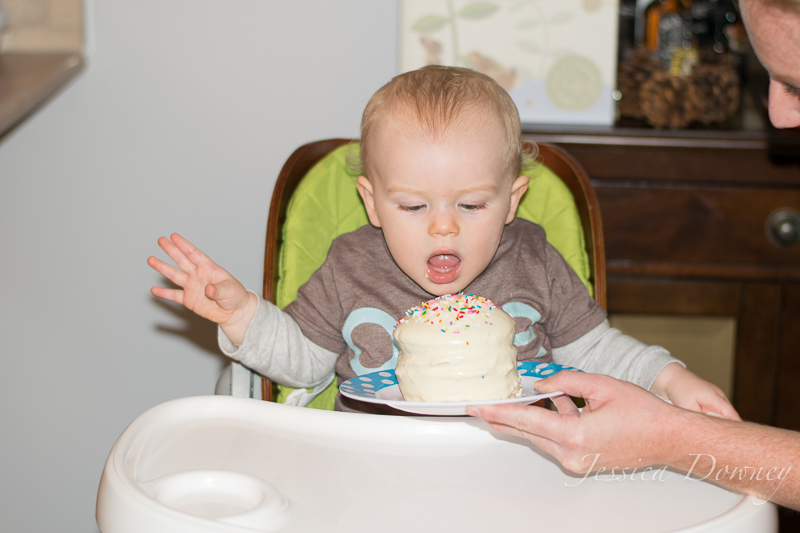 To say this boy loved his cake would be a huge understatement. He DEVOURED it! 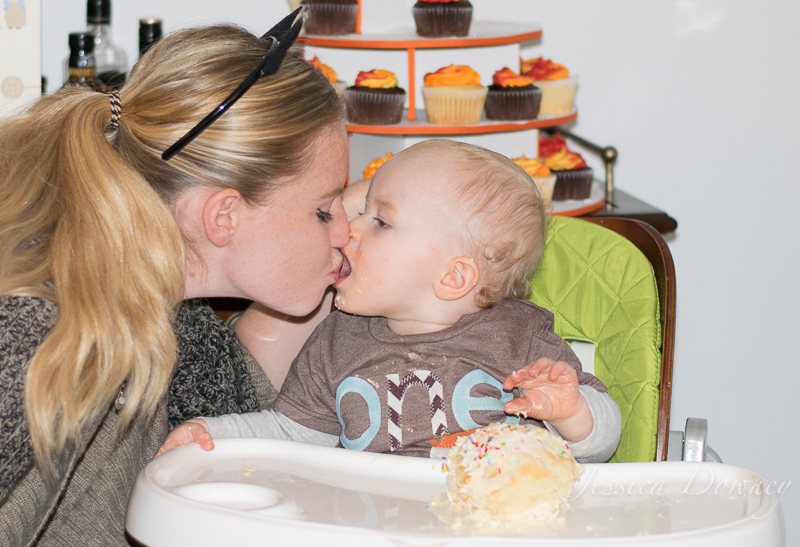 He literally dove face first into the cake and refused to use his hands. It was hysterical. I didn’t have high expectations for how he would like his cake since I’ve been to a few kid’s parties before where they just stared at everyone because everyone was staring at them or they just picked at the cake but Nate did not disappoint. 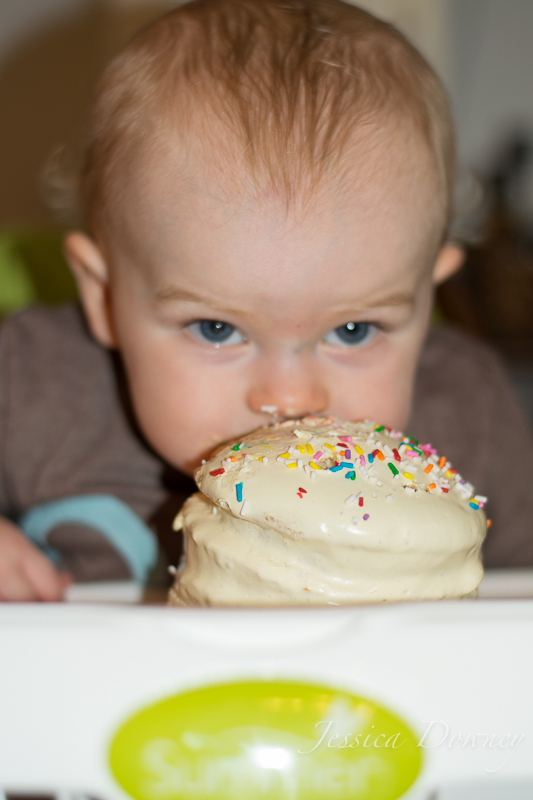 He attacked that cake and enjoyed every mouthful. It was definitely a high light of the party that’s for sure! This crown was another thing I had high hopes for. Nate did pretty good and kept it on for most of the start of the party then pulled it off towards the middle. 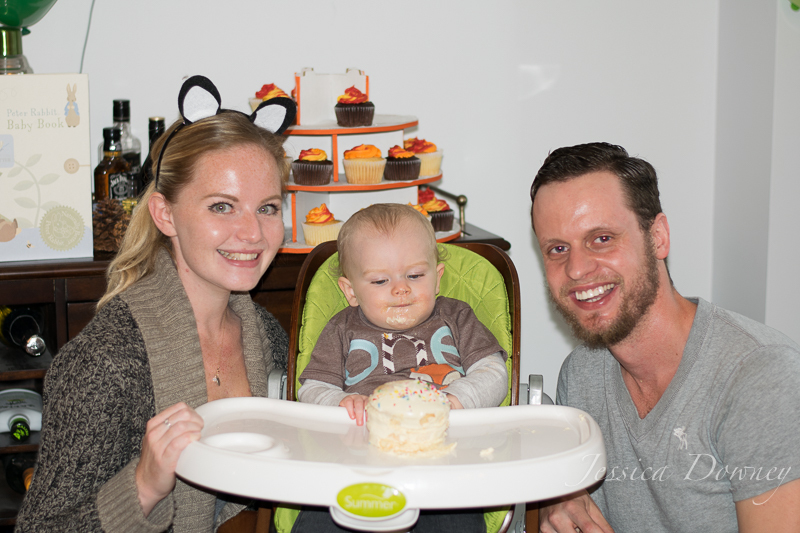 We managed to get these pictures of him with it on his head while he was preoccupied with his cake. 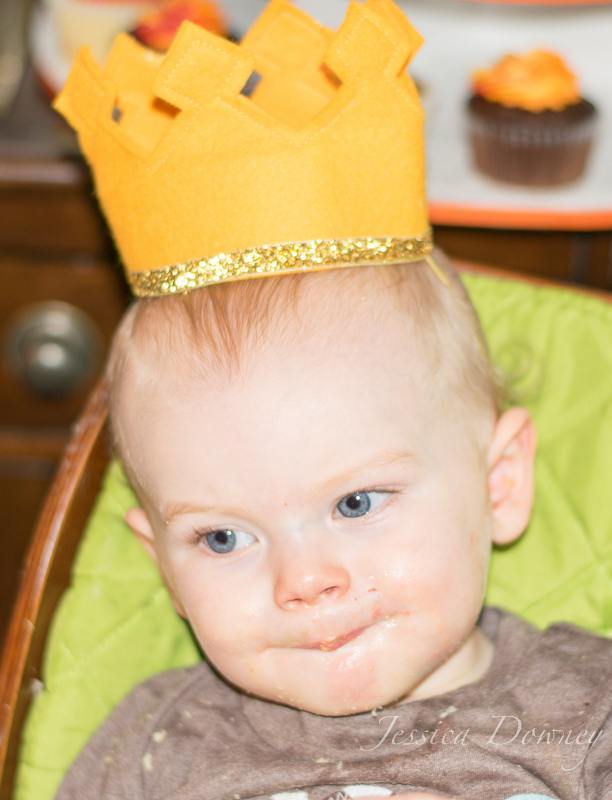 It was so cute to see him finally wearing his birthday crown! This was one of the things I ordered from Etsy back in the summer and then it sat around waiting and waiting for its special day. It was the perfect size for Nate’s head too! It was a little smaller than what I had originally thought but when I tried it on it looked even cuter being smaller. 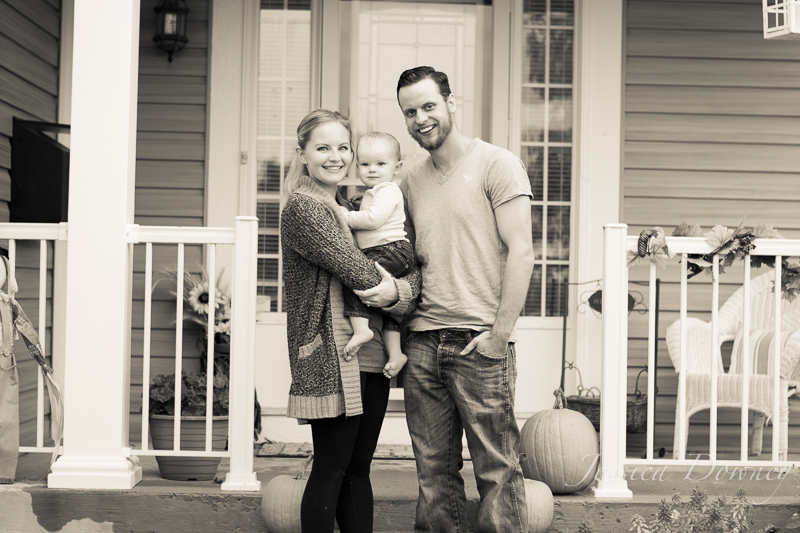 We also used it as a prop during his First Birthday pictures that I’ll post soon. All and all, it was a fabulous birthday party! 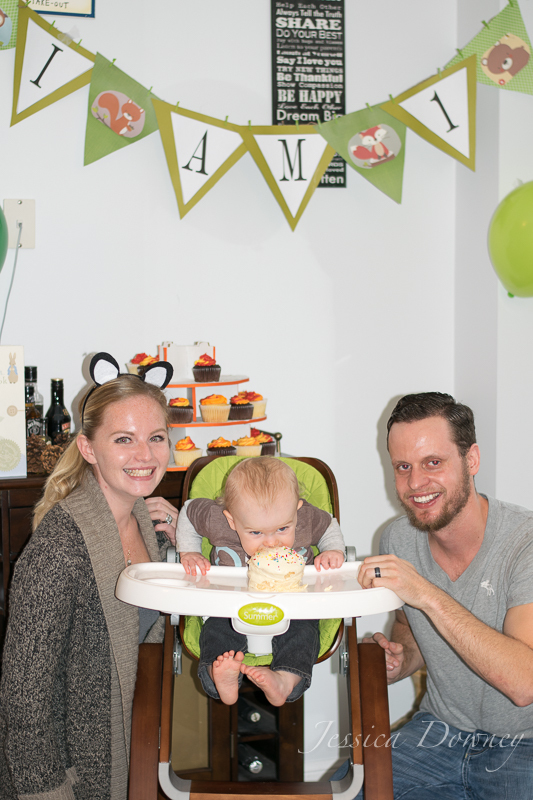 Nate got so spoiled with toys and clothes and we got to spend the day showering our baby boy with all the love in the world! 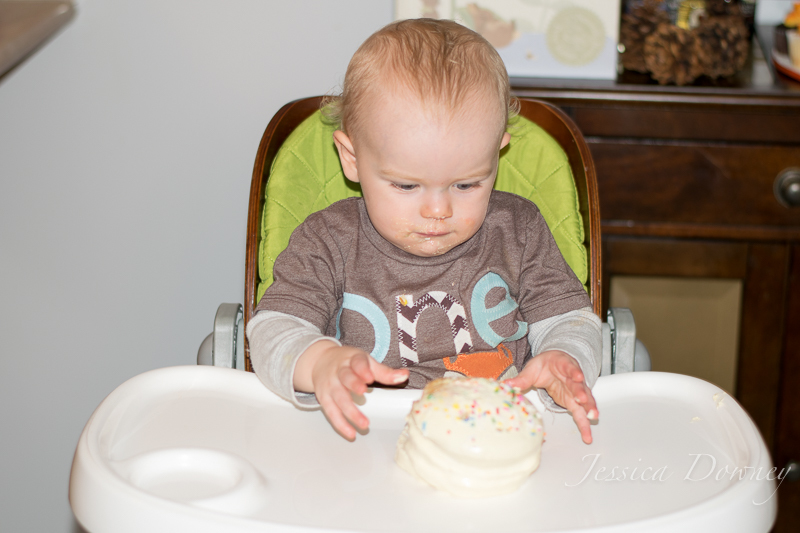 I still can’t believe he is ONE now! Where does the time go!? Next Post 12 Month Check Up!